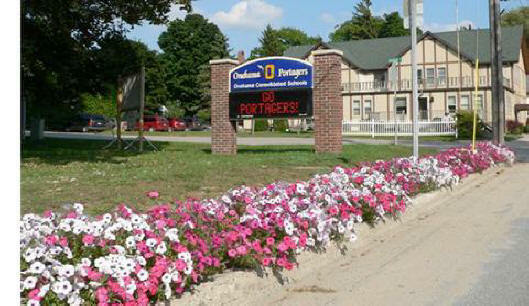 The Village of Onekama celebrated with a beautiful display of petunias again this year, and it is one of the best welcome wagons to a community in this area. 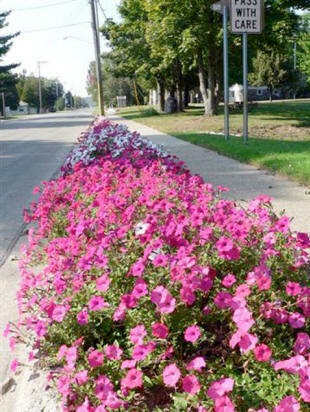 The multi-colored curbside beds were also accented with a dozen barrel planters. It was a real team effort from the entire community that helped make the 2009 event a major success. 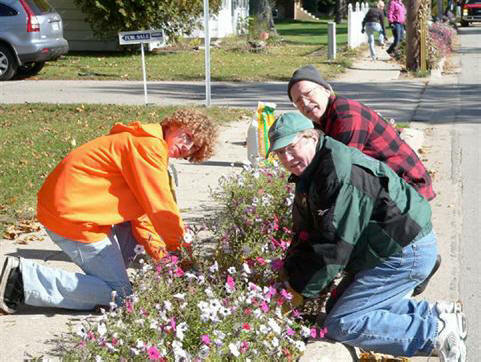 From start to finish, the annual Portage Lake Association Petunia Parade would not be a success without Putney’s Greenhouse (Arcadia) and the support of over 60 volunteers, downtown businesses and agencies that donate their time and personal commitment to beautifying Onekama. Organizers of the annual event say the feedback they receive on the program is always extremely positive. The community and all who visit Onekama appreciate their efforts throughout the summer and fall seasons. As the 2009 season comes to a close, organizers are already looking forward to the future of continuing the tradition. It is a tradition they work hard on to maintain the outstanding quality. The beds have been cleared and readied for next seasons planting when the snow clears in the spring of 2010. Organizers of the event offered a special thank you to the over 15 volunteers, sponsors and students of the Manistee Foundation Youth Advisory Council and the Onekama High School and Onekama Girl Scout Troup 10460 who helped with this years clean-up and spring preparation. 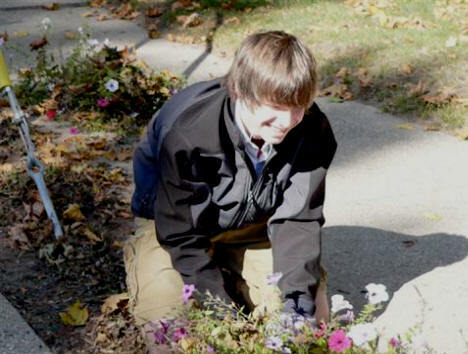 TEAMWORK: Youth Advisory Council member Austin Barnett (left) is joined by volunteers Phil Joseph and Jon Phillips in removing this years petunias at the end of the season. 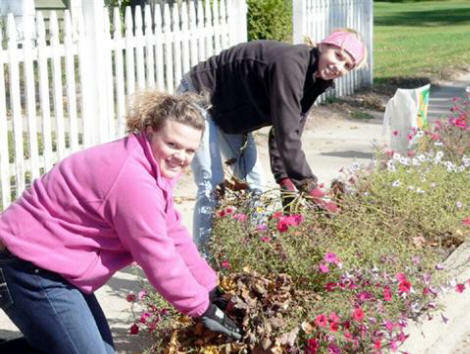 HARD AT WORK: Jennica Mathieu and Emily Pomeroy pull out petunias at the end of the season. 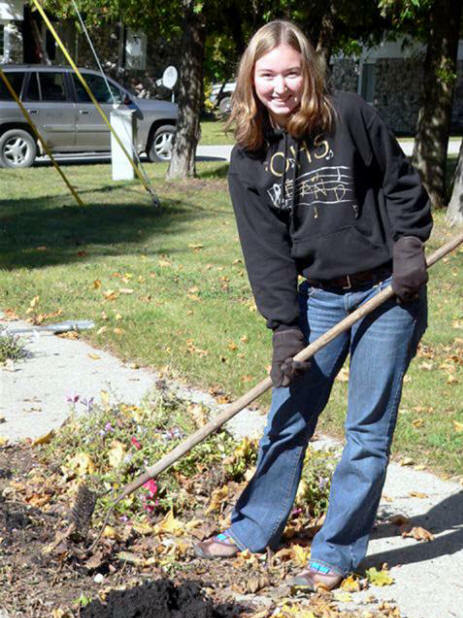 RAKING UP: Onekama High School student Madalyn Harvey is shown raking the flower beds to prepare them for the 2010 Petunia Parade.